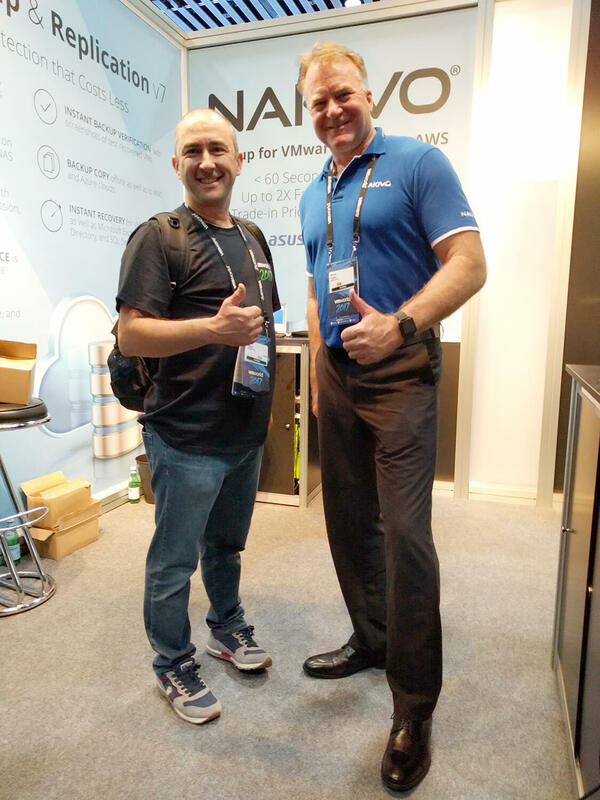 NAKIVO Visited VMworld 2017 Europe: We Rocked! 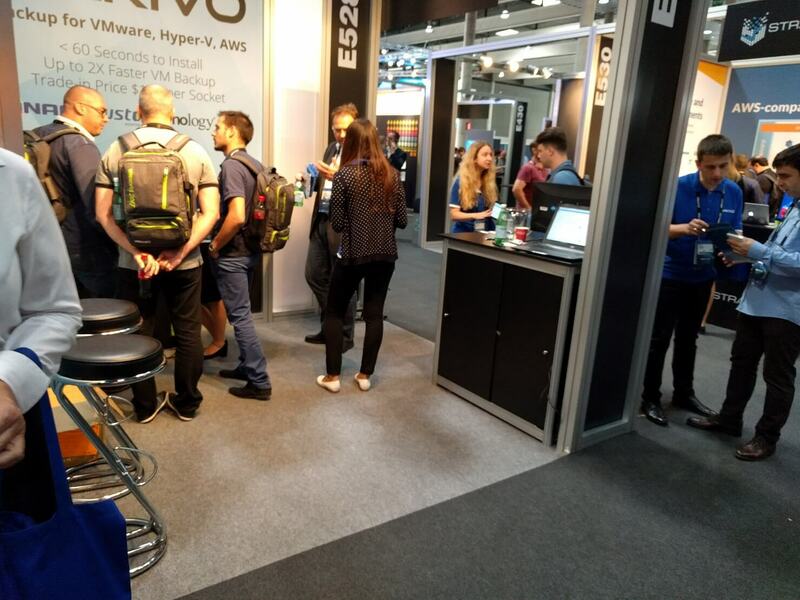 NAKIVO Blog > NAKIVO Backup & Replication > VMworld 2017 Europe: NAKIVO Rocked! Last week, some of our team members were as busy as a bee. We were taking part in the European VMworld held not long after the VMworld US show that left us with many pleasant memories and unforgettable impressions! It’s no question that these four days were both tedious and awesome. We had even more booth visitors than we had in US and ran many live demos of NAKIVO Backup & Replication and its variety of features. Fira Gran Via, Barcelona was also the place where we announced our Q4 2017 promotion – NAKIVO Backup & Replication Basic Edition with the price of just $99 per socket. Our visitors were favorably impressed by the excellent value for money provided by the Basic Edition. So, small businesses worldwide are now able to use all of the core features of NAKIVO Backup & Replication they need to protect their virtual infrastructures at an affordable price. The Basic Edition can be installed on NAS (QNAP, ASUSTOR, Synology, and WD), Windows, and Linux and deployed as a VMware Virtual Appliance or AWS Amazon Machine Image, and includes a comprehensive set of features small businesses need to secure their valuable VM data, such as VMware Backup, Hyper-V Backup, VM recovery, Global Data Deduplication, and many more. You can learn more about the Basic Edition and included features here. We had numerous meetings with our partners. These meetings were fruitful, as we discussed the current partnership results and determined our plans and steps for the future. We also met with the representatives of QNAP, which is our long-term partner in offering businesses an ideal solution for keeping VM backups safe – a NAS-based VM backup appliance with all useful features provided by NAKIVO Backup & Replication. We also met with media representatives and bloggers from the sphere of virtualization. Below, you can watch the interview of NAKIVO CEO Bruce Talley to Vladan Seget, who is among the Top three virtualization bloggers of 2017. 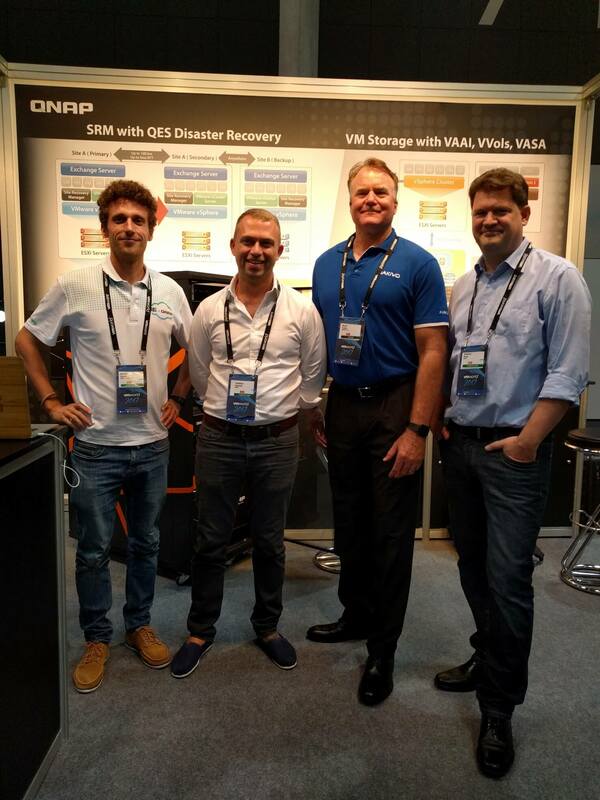 The VMworld Europe show was wonderful and eventful. We were tired but happy, and now we eagerly look forward to next year’s VMworld that we surely won’t miss.